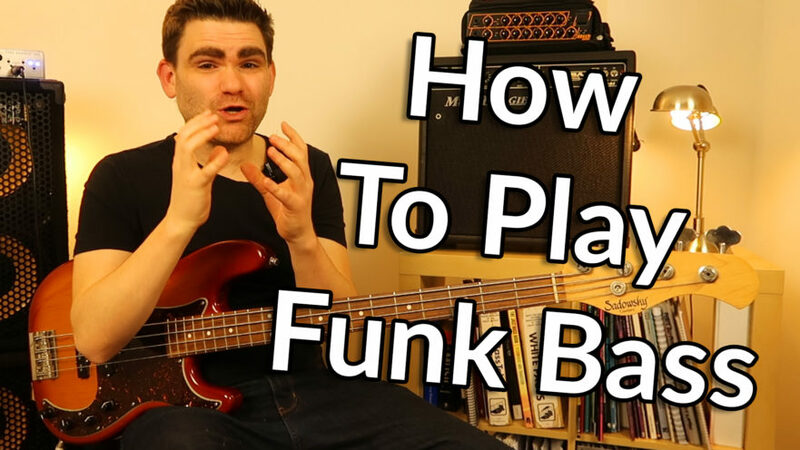 Click Here To Download The FREE How To Play Funk Bass PDF! Welcome to Part 3 of the Walking Bass Series... In this bass guitar lesson I'm going to talk to you through how to play funk bass guitar using the Walking Bass techniques from earlier in this series! One of the great things about learning Walking Bass is it gives you the knowledge to understand and play so many styles of music - Rock to Pop, Soul to R&B, Country to Latin... even classical music, to name a few. In Part 1 of the Walking Bass Series I showed the 3 Core Concepts that create Walking Bass Lines and today I'm going to show you how to use the same principals to create fills in a funk feel or groove. Often on a Jazz Jam musicians will 'call' tunes in different styles - not just a '4 in bar swing feel'. The great news is all of the fantastic knowledge you obtain from studying walking is DIRECTLY transferable. Let's first of all create the basic funk groove, then I'll show you how to create bass fills using scales, chord tones and chromatics. If you haven't already done so, I encourage you to watch Part 1 and Part 2 of the Walking Bass Series to give valuable context for the ideas in this lesson. Funk Bass in my opinion is one of the best styles of music you can play on the bass guitar. Personally I love it! Speaking very broadly Funk music is based on the 16th note subdivision. Understanding how this works will get you considerably ahead of the game. 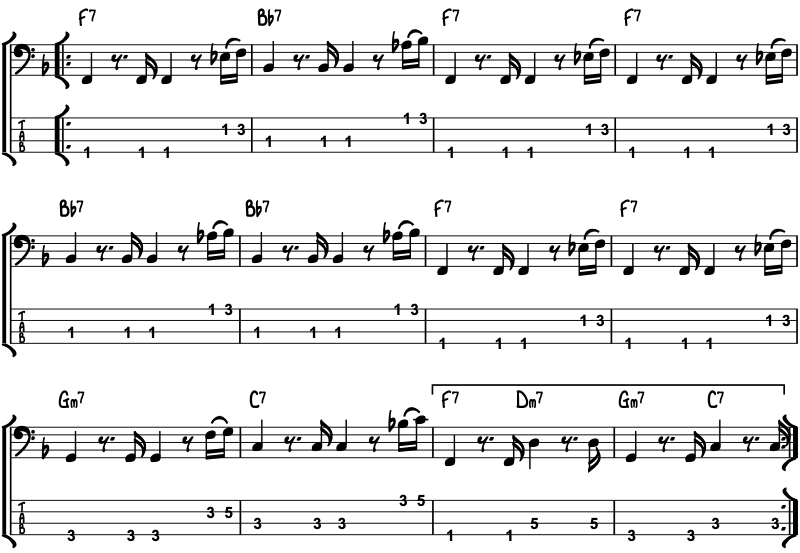 Seeing the 16th notes visually as a 'Groove Matrix' is a great place to start and will definitely help if you're learning how to play funk bass from the ground upwards. The 'Groove Matrix' shows the strong notes (beats 1,2,3 & 4) as long lines and the 3 further rhythmic note placements you can find 'inside' each beat as shorter lines. The best place to start creating a simple funk bass line, using the 16th note concept, is playing just 3 notes per bar as follows: Beat 1 | Beat 2a | Beat 3. Beat '2a' is on the last 16th note of the 2nd beat. To put this idea into context we are going to use it over a Jazz 12 bar blues, played using a funk feel. The melody played on the track in the video is a Charlie Parker tune called 'Now's The Time'. 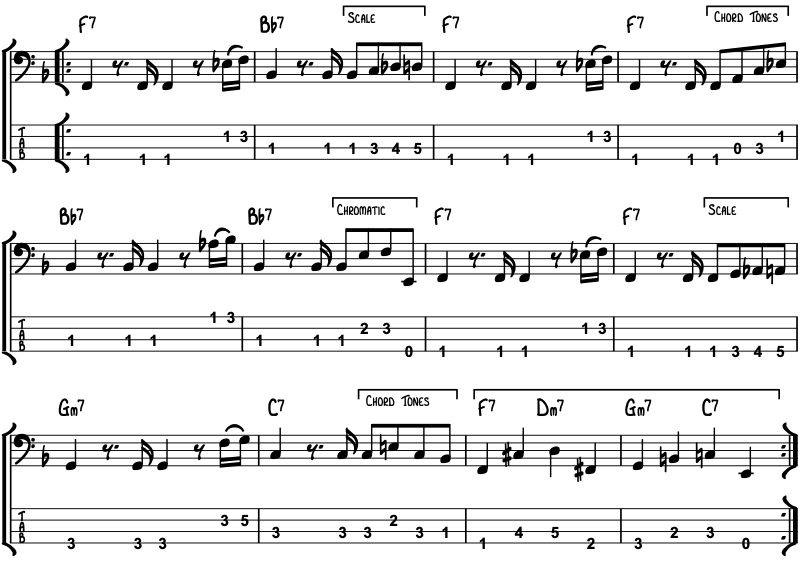 If you're already familiar with the 'standard' blues sequence make sure you take a good look at the chords and how they have been adapted to work in the jazz context. They can be a lot of fun! 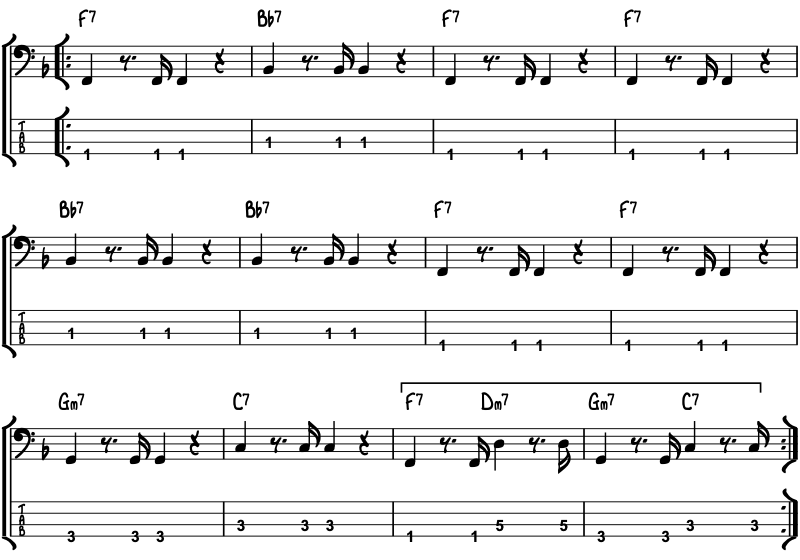 The last two bars of a blues sequence is often called a Turn Around. This is highlighted above with a bracket above it. The chord sequence moves at 2 chord changes per bar, so I have adapted the bass line to work over this. As I said earlier there are many, many ways this bass line could be developed. Some funk bands like to leave their bass lines really sparse others prefer their bass lines much busier. This is purely personal taste and there's no right or wrong approach. Here is a simple idea to develop the funk groove in to a 1 bar bass line that can easily be simper-imposed over the first 10 bars of the blues sequence. In this example we are adding two more notes which are place on the last two 16th notes of the bar. Using the Groove Matrix above we can call identify these as beat 4& and beat 4A. We are going to use the classic 'box shape' which falls beautifully under the hand and add in the Flat 7th and Octave for each bar / chord. This will add a little more movement and interest to the bass line. The great thing about playing funk bass is there is plenty of scope for creating very tasty bass fills. To integrate the fills we are going extend our bass line from a 1 bar groove to a 2 bar groove. The fill will be placed on beat 3 & 4 of the second bar of the bass 2 bar bass groove. Above each fill I've put a bracket denoting which of the 3 concepts I'm using. Take each fill apart slowly and analyse each concept note by note. Part 1 of the Walking Bass Series will really help! I originally picked this up from listening Anthony Jackson records from the late 70s with artists such as Chaka Chan. The principal of 'Big Fours' is simply creating a bass line that used long quarter notes. In the last example I've added the 'Big Fours' to the turnaround in bars 11 & 12 and using a simple walking bass line with Lower Chromatic Approach Notes. The reason this works so well is the Big Fours create musical light and shade ... and sound so different to the short 'funky' notes we've used in the previous 10 bars. This is the end of the 3 part Walking Bass Series - we've covered a lot of ground! As I've hope you've discovered Walking Bass is a seriously powerful technique and it has capability of helping you understand and play virtually any style of music. If you'd like to take the ideas further in this lesson make sure you check out The Essential Walking Bass Course inside The Bass Lab PLUS Membership where I take you deep into all of the concepts we've discussed in this series.